Last month, Creative Experience hosted two events with writer and educator Aza Njeri. 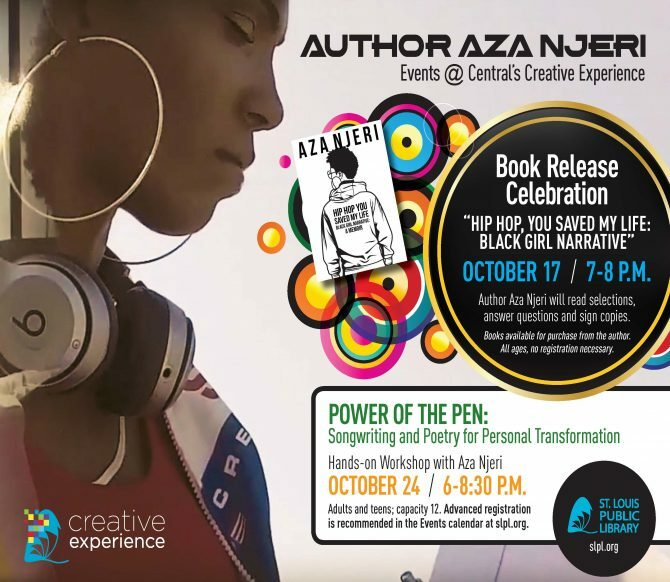 A packed house celebrated the release of her new memoir Hip Hop You Saved My Life: Black Girl Narrative on October 13th. A week later, she sat down with a more intimate group of patrons, who used Aza's writing prompts to create a collaborative song that producer Darius Marcel Hagens recorded and arranged in the Creative Experience Recording Room. Check out the group's finished song Dreamers on a special bonus episode of Your Library Podcast. The song was produced by Darius Marcel Hagens and features Bernadette Marty, Alex Archambault, Steve Parish, Jan, Honna, Asa Summers El, and Aza Njeri. Stay tuned for announcements of another workshop with Aza and other special events during Hip Hop Appreciation Week at The Library, the third week of May. Your Library Podcast is a monthly audio program that takes you behind the scenes of St. Louis Public Library and features resources, events, and people from throughout the library system. It is produced and hosted Honna Veerkamp and Mary Meyer. Additional music in this episode is by Garry Moore. Listen or subscribe for free at iTunes, Google Play, Stitcher, or Soundcloud. For more information contact us at podcast@slpl.org.